4 out of 5 based on 19 ratings. She wanted life. He needed her blood. 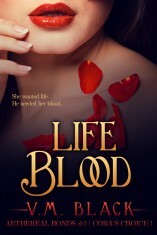 Cora Shaw will do anything to live. Diagnosed with terminal cancer in her senior year of college, she is given a choice: Call hospice, or seek out a mysterious man who promises an impossible–and insanely dangerous–cure. She knows him only as Mr. Thorne, a reclusive billionaire who seems full of contradictions. A man with strange, impossible powers over her. A man, she discovers, who is not a man at all.